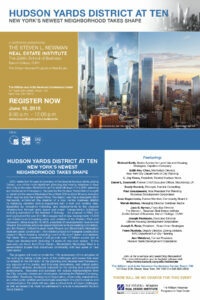 On June 18, the Steven L. Newman Real Estate Institute will be hosting a conference marking the 10-year anniversary of the adoption of the Hudson Yards Zoning District, one of the most significant planning and zoning initiatives in New York City in decades. The half-day program will look back at the creation and implementation of the plan, present major development projects, and discuss future challenges that must be addressed to ensure its success in the future. Richard Barth, Senior Advisor for Land Use and Housing Strategies at Capalino+Company helped organize the conference and will lead one of the panels. Featured participants include a keynote address from Daniel L. Doctoroff, former Deputy Mayor, as well as representatives from the City of New York, major developers, community stakeholders, and individuals essential to the plan’s creation and implementation. RSVP: There will be no charge for this event. For more information, download event flyer (PDF).